Discussion in 'Books, Films, TV, Radio' started by Smudger Jnr, May 5, 2011. It all started when I read Marc's first post about him researching his father's Military History and after years of painstaking research work, resulted in his book being published. I looked at his website and then the article in Wikipeadia and decided that this book was to be entered on my wish list. Having spend quite a sum over Christmas I was contenting myself for a wait. As I thought the story was so good, I passed on the website to a WW2 Vereran friend who replied back that it was a thoroughly amazing story. This same friend was invited to my Birthday Grill party and duely handed me a package for my Birthday and said that I would more than likely enjoy the contents. Yes you guessed it and I was not to be disappointed. I have just finished reading the book which I found to be just as compelling reading as my Last Dan Brown Book, in as far as I could not put it down after I had finished the first chapter. The book is very well written and a credit to the author in bringing a exceptional mans story to the fore. One can only think of the personal agonies that Marc's father went through as he flew over his German Homeland and dropped bombs, especially when he was Piloting the bomber over his own town of Hanover. feats of Marc's Father, Georg Franz Hain known as Peter Stevens. I wish mark every success with this book and can certainly recommend it. My book appears to be the first cover version without photo. Son of POW-Escaper likes this. Blimey Tom, that's what I call a positive review. Direct link to the book being mentioned, and a title, might help? OOpps I cut and forgot to paste!! Wow, Tom, very high praise indeed! Many thanks for your very kind words. By way of clarification, the original hardcover art is the top one. That edition is just about sold out, and Pen and Sword will be publishing the paperback version (bottom artwork, with Dad's photo) sometime in the next 2 months. Again, my gratitude for your efforts in getting this story better known. Thanks for the review Tom, as I have the book on my list of 'must get'. Now I'm really looking forward to reading it. Fantastic review Tom and best of luck Marc, sounds like a really interesting story. Just finished reading it, and agree with Tom - a truly great read. Very sad, very inspirational, very moving. Well worth reading. Well done Marc, look forward to the movie? I concur, an interesting read. Thanks very much, Wendy (and David too). From your mouth to God's ear, Wendy. 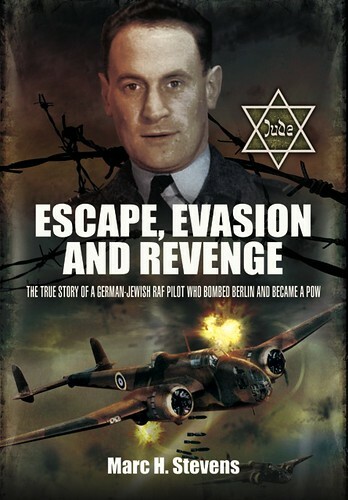 I'm very pleased to announce that the new paperback edition of Escape, Evasion and Revenge is now available from Pen & Sword in the UK. The major online booksellers should have it in stock sometime soon. Once again, I am very grateful for your interest in my father's story. This sounds like a very interesting read, i'll definitly have to look into it! Tonight marks the 70th anniversary of the night my late Dad, Squadron Leader Peter Stevens MC, was shot down and began his 3 years and 8 months as a POW. As a German Jew fighting the Nazis, his entire period of captivity was without protection under the Geneva Convention. 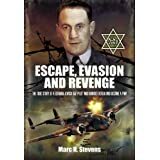 He went to become one of the most ardent POW escapers of the war, and is mentioned in at least 10 books (including my book: 'Escape, Evasion and Revenge'). Sadly, it also marks the 70th anniversary of the death of Dad's rear gunner, Sgt Ivor Roderick Fraser, whose parachute failed to open when he bailed out over Berlin. Both gone, but never forgotten. Curious...is the book at Indigo/Chapters? They did not carry the hardcover in the stores, but they did sell it online. It is now sold out, and the paperback is due to arrive here within a few weeks. They don't yet show it online, but soon should (I hope). The stores will definitely special order it, however. The paperback's ISBN is: 978 1 84884 554 1. "So much could have gone wrong with a biography written on these terms, but Marc Stevens has succeeded admirably. This is not a rose-tinted hagiography by an awe-struck son; rather, it is judicious and even-handed – “warts and all,” to use the cliché." "This is a wartime career that would make any son proud, but Stevens’ real triumph is in writing a biography that will satisfy the most discerning historian." 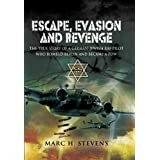 The latest review of 'Escape, Evasion and Revenge', this one written by Distinguished University Professor in History at the University of Western Ontario, Dr. Jonathan Vance (author of 'A Gallant Company: The True Story of The Great Escape'). The review was published in Canadian Military Journal, Vol. 12, No. 4. High praise Marc and well deserved. Objectivity, when it concerns your own father and your own life, is not easily accomplished. Personally, I appreciated that you resisted the urge to attempt to fill in the many blanks in your father's life or behaviour. At the end of the book he was, for me, as he must have been for you, an enigma without much hope of a full explanation.